Anne Jacqueline Hathaway (born November 12, 1982) is an American actress. Her brakthrou debut film role wis as Mia Thermopolis in the Disney comedy The Princess Diaries (2001). 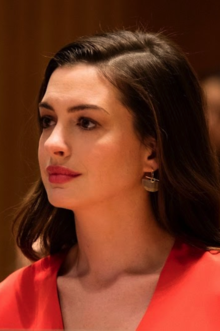 Hathaway made a transeetion tae adult roles in box office an creetically acclaimed films sic as Brokeback Mountain (2005), The Devil Wears Prada (2006), as Jane Austen in Becoming Jane (2007), Rachel Getting Married (2008), Bride Wars (2009), Valentine's Day (2010), as the White Queen in Tim Burton's Alice in Wonderland (2010), Love & Other Drugs (2010), as DC Comics femme fatale Catwoman in Christopher Nolan's The Dark Knight Rises (2012), as Fantine in Tom Hooper's Les Misérables (2012), Interstellar (2014), The Intern (2015) an Alice Through the Looking Glass (2016). This page wis last eeditit on 17 Dizember 2017, at 20:03.